The Jal Mahal lies on the way to Amber in Jaipur City. It is located at a distance of approximately 6.5 kms away from beautiful Pink City. While moving to this Palace there are many other memorials of Royal families which tourists can visit. One of the fascinating things about the Jal Mahl is that it is placed at the centre of the Man Sagar Lake. It is very exciting to see the first four floors of this Mahal as they are submerged under water of the Man Sagar Lake. Only the top floor is visible to the visitors and it is the only floor which enjoys sunshine as well as rain. The Palace and the Man Sagar Lake provides great views that will simply touch our eyes. On the eastern side of the Lake, the Man Sagar Dam is located which is a good point for viewing the Valley and the Man Sagar Lake. Jal Mahal is also known as Water Palace as it is fully surrounded by the Man Sagar Lake. During rainy season one can enjoy the beauty of this palace as the red stones become more amazing and appealing to eyes. The Mansagar Lake is also a bird watcher paradise as it serves as the home of a variety of local as well as migratory birds. Eco system of Man Sagar Lake is a favorite home for many resident and migratory birds. 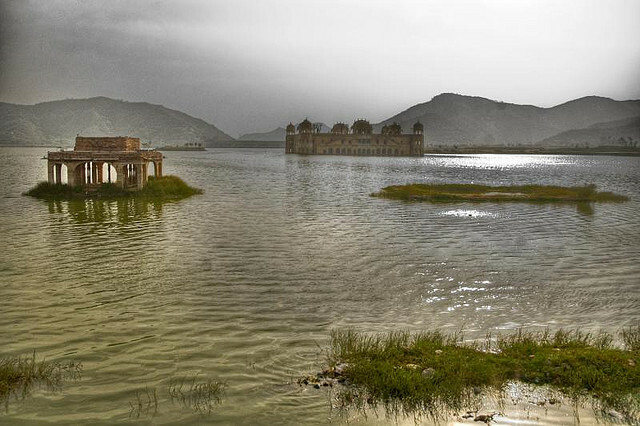 This palace looks best when the Man Sagar Lake is full of water in it as the reflection of Jal Mahal looks fabulous in the Lake. The palace seems very beautiful in the evening as the entire complex looks like bathed in flood lights. Hundreds of migratory birds can be seen swimming in winters in the Man Sagar Lake. Though visitors are not allowed to go inside the Palace, but the banks of the Man Sagar Lake have become a popular picnic spot for the tourists. Bird Watching, camel rides and ice creams available on the bank of the Lake cannot be missed if one is visiting this palace. Jal Mahal is located near the famous tourist attraction of Jaipur, the Nahargarh fort. Visitors are not allowed for the entry in Jal Mahal Palace though sightseeing from a distance creates a deep interest of visiting the Palace. The wonderful setting location and the architectural beauty of Jal Mahal make it among one of the best attractions of Pink City. Calmness of the lake can be enjoyed by sitting under the beautifully designed and carved balconies and arched roofs having in mind the feeling of Royal menus of the duck shooting parties. Many royal dignitaries were invited by Maharaja Sawai Madho Singh to this leisure Palace who really enjoyed the ambience with their adventures autobiographies. There are some beautiful gardens on the south side of the Lake which are the best example of Rajput architectural style. Traditional boat makers from Vrindavan are always there to help you to enjoy the boat ride in the same Royal Rajput style wooden boats. The hallways are very well decorated which can be seen while walking through them. The life of the emperors of that time can be pictured by visiting this palace. The boats which are used today in the Man Sagar Lake are a copy of Rajput style wooden boats and they can be depicted in paintings. The top floor of the Jal Mahal is very well maintained and preserved as it was in ancient times. The chhattris in the Chameli Bagh are decorated with murals. The fountains and the floor coverings are made up of marble. Plan a trip to this famous Jal Mahal Palace and to see other attractions of Jaipur. The best time to come here for boat ride is from the month of October to March. Rush to feel, the out of the world enjoying experience at the island Palace where the cool breezes after touching water surface will rush to refresh you.